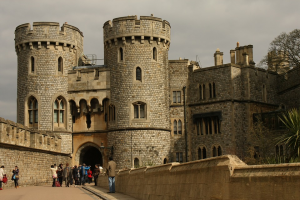 Windsor Castle: Originally built in the 11th century, British royalty has been adding on to an changing the castle since then. It was used by the royal family during the bombing campagins of WWII and survived a fire in 1992. Today it is a tourist attraction, a venue for holding state visits and a weekend home for Queen Elizabeth II. Most recently, Prince Harry and Meghan Markle were married there. Lets get to the ghosty bits cause it’s a 1000 year old fortress. It’s got some history. Supposedly Henry VIII haunts the cloisters groaning and dragging footsteps are heard. The Deanery is haunted by a young boy who shouts, “I don’t want to go riding today.” There are also footsteps heard in the building. They might be his. The kitchen in one of the buildings that used to be the stables is haunted by a man leading a horse. They walk straight through the wall. A young girl has also been seen there standing by a Christmas tree. Queen Elizabeth I is a very busy ghost. Said to haunt the Royal Library at the castle, the sound of her high heels and then her figure appears. King George !! claimed to have had a conversation with a ghostly woman who claimed to be married to England. And the present queen’s father George VI is said to have observed Elizabeth’s ghost 8 nights in a row during the first days of WWII. Except for a brief period between 1649 when the monarchy was overthrown, There has been a master of music since 1625.
back in the day this person regulated minstrels…they wanted them to be part of a guild. Today the post is compared to a poet laureate and is given to people in the field of classical music for a period of ten years. The current Master of the Queen’s Music is British composer, Judith Weir. Since then, only 15 pipers have held the position. It is their job to play under the queen’s window every weekday when she is in residence at Buckingham Palace, Windsor Castle, The Palace of Holyroodhouse or Balmoral Castle. Every weekday at 9 am for around 15minutes. Job was to tend and swan-upping. Gathering the swans on the Thames for royal banquets. As of 1993 it’s now two jobs. Warden of the Swans and Marker of the Swans. They health check and census them instead of eat them. Person breaks in the Queen’s shoes so she doesn’t have sore feet. While wearing them at events. Winds, cares for and repairs over 1,000 clocks thermometers and barometers at the royal residences. a role created during the reign of Henry VIII to monitor and assist in the King’s bowel motions. along with water, towels and a wash bowl. Would have organized his day around the king’s predicted motions. the option to have any used bedchamber furnishings. would have almost certainly helped the monarch undress for each occasion. including John Stuart who would later go on to be Prime Minister of Great Britain! Quite amazingly, the role of Groom of the Stool carried on all the way until 1901 when King Edward VII decided to abolish it.